14 well equipped apartments in a superb location in the heart of the Old Town in Prague, just 3 minutes walk from the Old Town Square and Charles Bridge, and 5 minutes from Wenceslas Square. 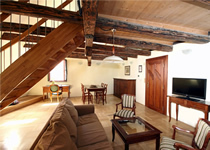 The 3* Jilska Apartments in Prague are set on a quiet street, in a reconstructed house dating from the 14th century. Choose from one, two and three-bedroom apartments. Apartments feature a choice of single or double beds. All come with lounge/dining areas, fully equipped kitchens and modern bathrooms with either a bath or shower. Facilities include: bed linen and towels, refrigerator, oven, microwave, cooking utensils, kettle, toaster, coffee maker, crockery, cutlery, hairdryer, iron & ironing board, Satellite TV and free Wi-Fi. There are restaurants, cafés and bars to discover all around the apartments in the Old Town (see 'Nearby Places' for restaurant recommendations). Secure underground parking is available nearby at 660 CZK per night.